Caribbean birds are infinitely fascinating and unique. Unfortunately they face many human-caused threats such as destruction of their habitat, pollution, introduction of harmful invasive species, and impacts from climate change. I have been working in the Caribbean for 30 years to study and conserve these birds through research, education, capacity building and conservation action. Waterbirds are of special interest to me—they are especially vulnerable because of their use of coastal habitat and wetlands. I've spent countless hours studying and carrying out surveys of different species of ducks, herons, egrets, marsh birds, shorebirds and seabirds, including studying White-Cheeked Pintails in the Bahamas for my PhD. I am also a co-author on several books and manuals on studying and monitoring waterbirds and wetlands. I'm especially interested in gathering data that will not only advance our scientific understanding of these species, but applying that knowledge to conserve them. Raising awareness and encouraging local citizens and partners to get involved in science, monitoring and conservation is vital to ensure long-term survival of these amazing birds. I have a B.S. in Wildlife, Fisheries and Conservation Biology from the University of California, Davis and a Ph.D. in Ecology, Evolution and Behavior from the University of Minnesota, Minneapolis. 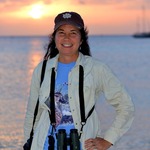 As Executive Director of BirdsCaribbean, a 501 (c) 3 nonprofit dedicated to the conservation of Caribbean birds and their habitats, I lead a number of BirdsCaribbean projects and programs that raise awareness, promote sound science, and empower local partners to build a region where people appreciate, conserve and benefit from thriving bird populations and ecosystems. Awesome report Will! Looking forward to hearing more about your findings and seeing more photos!! Wonderful description of you encounters with Caribbean endemic birds Ellie, thanks for sharing - I feel the same way! Thanks SO much Capt. John, you helped make it happen and we are really grateful!!! Thanks John, We will definitely keep you updated!